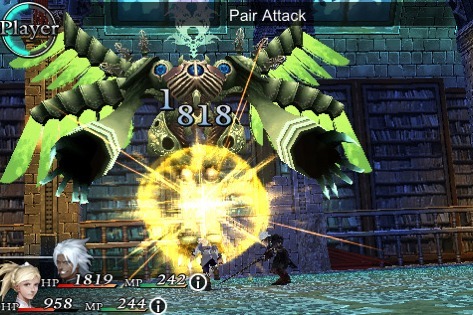 Square Enix's iPhone RPG is worth the dough. Square Enix's decision to bring both Final Fantasy and Final Fantasy II to the iPhone was no surprise, since numerous publishers have re-released classic games on Apple's device. The announcement of a new intellectual property, however, piqued our collective interest, especially since the company has shown more love to both the DS and PSP. The proverbial fruit of its labor, Chaos Rings, is anything but a rush job. This exciting and fun role-playing game sports attractive graphics, a gripping story and a solid battle system, making it one of the iPhone's most impressive (and unfortunately, most expensive) Apps. 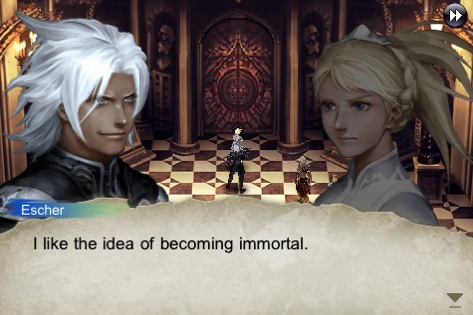 Chaos Rings tells the story of four groups of warriors, yanked from their world and thrust into a high stakes tournament where they must fight to survive, with the winning pair receiving eternal life; those who resist face the grim reaper. With four unique stories that eventually intersect, there's quite a bit of value for the budget conscious gamer. Before entering the Ark Arena, each couple must plow through a series of dungeons, destroying various types of monsters in order to level up and collect tons of loot. With each randomly generated battle, players have one of two options. They can attack solo and make selections for each individual character, or fight as a group. While choosing the latter would seem like the smartest decision (a group strike is more powerful), it leaves them both open to attack, so we suggest using it wisely. Thankfully, each character possesses melee and magic attacks, so there's plenty to choose from. In addition, you'll level up the more you play, so there's no need to always rely on double teaming a monster to defeat it. What makes the game so much fun is the aforementioned battle system and the overall accessibility. Unlike most Square Enix RPGs, you won't wade through what seems like an endless stream of text, or square off against bosses that take a half an hour to beat. Square Enix was wise to cater to the mobile crowd while keeping the quality intact. This is especially apparent in the difficulty. Instead of forcing players to enter progressively difficult locations, the user has the option to either go through areas with weaker or stronger enemies; naturally, it's much tougher to level up if you choose to stick with the lesser creatures. On top of that, expect to see a delightful mix of 3-D characters and hand-drawn and beautiful 2-D backgrounds (the bosses, in particular, are the most impressive), complimented by a quality soundtrack. In all, everything reminds us of an old PSOne RPG. Actually, the only thing bad about Chaos Rings is its $12.99 price tag. That's a bit higher than what most iPhone gamers are used to, but if you can spare the cash, this well-designed App comes highly recommended. What's Hot: Four different storylines, accessible controls, user-friendly battle system, attractive 3-D and 2-D graphics.